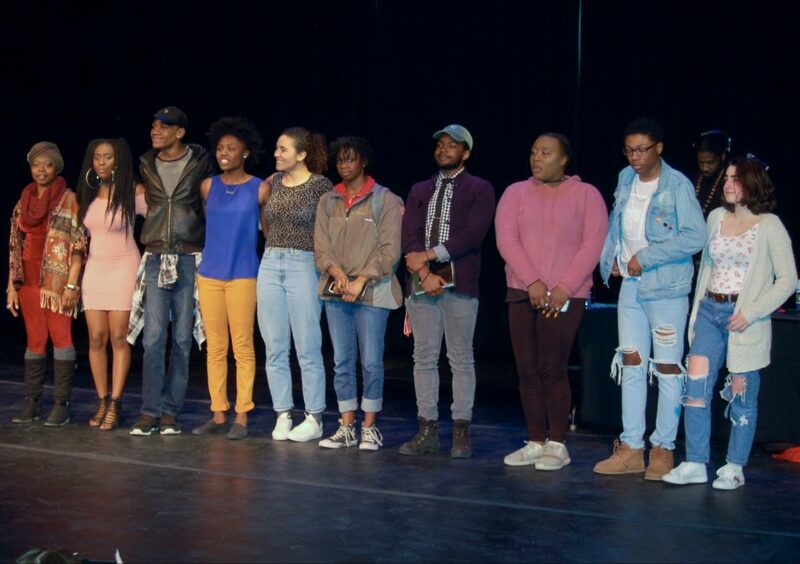 Judges select six local teens to compete in Houston’s international poetry competition. From left to right: Janiyah Moore, Aryanna Strickland, Dasonie Nelson, Nia Mooney, Olivia Keenan, Jasmine Roach, Jason Gray, Lhylia Tate, Andrew Jackson and Jenna Harb. Photo by Rachel Kubik. As a child, Janiyah Moore never was able to speak up. She lived with her single mother who was very religious, and Moore could not freely explain how she felt in any given situation. “It was her way or the highway,” Moore said in an email. “I was the child to shut down and not speak up for myself because when I was given opportunities to, I felt defeated and degraded,” she said. 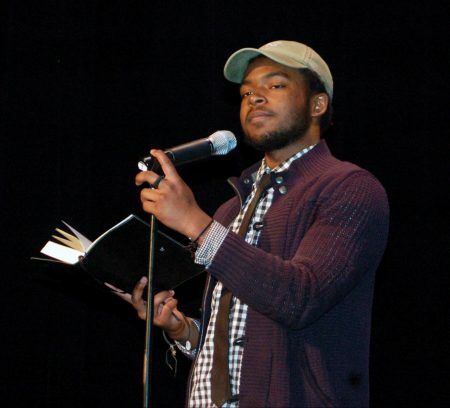 Now 19 and a Milwaukee Public School alumnus, Moore participates in Still Waters Collective, which “applies the craft of creative writing and the art of spoken word to build community, capacity and confidence,” according to its website. She was among 10 teens who recently performed original slam poetry at The Marcus Center for Performing Arts in Vogel Hall. Of the 10, judges selected six — including Moore, to represent Milwaukee in the Brave New Voices Final competition in Houston from July 18-21. 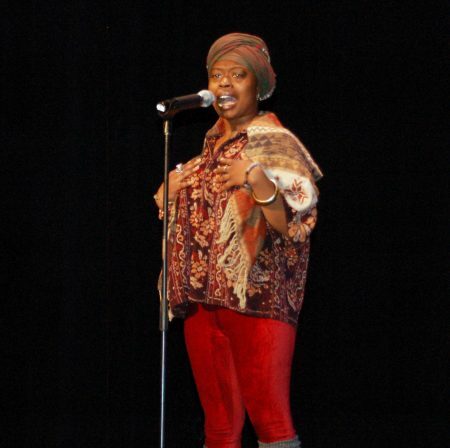 Janiyah Moore bases her slam poetry on colorology and numerology. Photo by Rachel Kubik. “The poems that they put up were amazing; I could tell the work that they did, and there was just a lot of love in the building, so I’m really proud,” said Dasha Kelly, founder of Still Waters Collective. She estimated that there were 80 to 100 people in the audience. Kelly said the five judges included a teenager, an adult from a non-arts industry, a representative from a local community organization, a young adult and a local artist. The judges individually rated each poet’s work on a scale of 10, and the students with the highest scores were selected for Houston. The students in the finals competed in preliminary slams, once a month for four months beginning in September. Kelly said about a dozen schools participate in the High School Slam League sponsored by Still Waters Collective. She added that participating in the league is a great way for young people to engage with one another. In addition to Moore, the winners were Olivia Keenan of Wauwatosa West High School, Nia Mooney of Rufus King International High School, Dasonie Nelson from Milwaukee High School of the Arts, Jasmine Roach of The Prairie School and Aryanna Strickland of Veritas High School. She added that slam poetry is a great way for participants to express their own thoughts as well as react to what others think. While Jason Gray did not make the Houston finals, he was proud of his performance. Photo by Rachel Kubik. Jason Gray, a student at Casimir Pulaski High School, entered the competition because he wanted an opportunity for his voice to be heard. He added that slam poetry allows people to express their thoughts and emotions to others. “(Poetry is) showing yourself to other people, being unafraid to be naked in front of someone,” he said. Although Gray was not chosen as a finalist for the Brave Young Voices Competition, he said he was proud that he did the best he could. Moore, an alumna of MPS, said she gets inspiration for her slam poetry by looking around and connecting with what’s in front of her. “Colorology and numerology (inspire) a lot of my poetry now … so now I’m just using all of my universal gifts to project forward to heal the crowd,” said Moore.